Visit the small Ligurian Town with its typical small alleys. San Lazzaro is part of the Borgomaro Municipality in the Imperia Province. The village has 105 inhabitants and is situated 170 meters above sea level. The place exudes that special Ligurian flair with its narrow streets and the beautiful old buildings. Who would not want to spend his vacation in a holiday house? 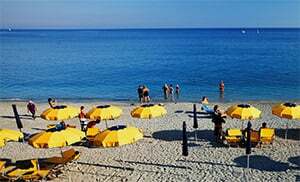 The small feast of Saint Lazarus depicts an impressive spectacle during summer, and inspires every visitor with the joy of life of the inhabitants as well as the Ligurian mentality. The inhabitants of the village mainly live on agriculture and principally on the growing of olives just as the green olive groves around the village may suggest. Thanks to the versatile vegetation of the region, numerous hiking and biking trails meander through the region, leading one to the Liguria’s natural scenery as well as to the neighboring villages. The visitors are able to find shops and small Ligurian restaurants in approximately 2 km from the main town of Borgomaro. The village Parish Church dating back to the 16th Century and a triptych showing the Virgin Mary with her child made by the painter Guidi da Ranzo are of particular interest. Besides, there are paintings on display in the church, representing, among others, John the Baptist, Mary Magdalene and Catherine of Siena. A well maintained bridge from the 15th Century runs across river Tresendo and adorns the small village. The Santa Maria Bambinan Oratory is also an interesting destination in San Lazzaro. San Lazzaro belongs to the Borgomaro Municipality and is a village in the Imperia Province located in the Liguria region. There are several other villages near San Lazzaro like: Candeasco (3.6 km), Borgomaro (1.9 km) and Garsi (1.9 km). When coming from Genoa, take the highway exit to Imperia Est and follow the SS28 via Torino to San Lazzaro Reale.